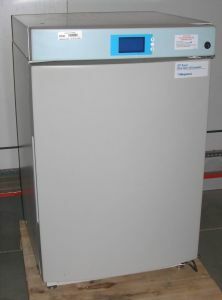 Product Description This Thermo Electron WJ501T-ABC water-jacketed CO2 incubator is designed to create a stable, reliable environment for cell culture applications. It operates at temperatures ranging from 5°C above ambient temperature to 40°C. It has a convenience outlet (115V/max 75Watt outlet) located at the back of the chamber, high and low level CO2 set point alarms, and high and low level temperature alarms.